We specialize in troubleshooting & remedial polishing works carried out on-site and in-situ where we are often called upon to rectify or improve on the work of our peers. Home owners, Landlords, Facilities Managers, Retail outlets, Boardrooms, Hotels & Banqueting; We will visit and attend to the impact of wear and tear such as scratches, water and heat marks, as well as larger projects. The benefits we can bring to you include cleaner more attractive wood finishes and will maintain high standards to the shared or public areas, usually more cost effective than replacement. 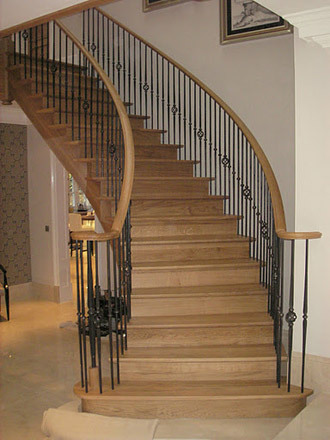 For more substantial refurbishment works or projects 'from new' we combine traditional polishing techniques with the best of today's modern materials to combine the aesthetics of a French Polish finish with 21st Century durability. Damage repair/touch-ups and courtesy checks following installations. Staircases, handrails, balustrading. Our speciality for both new and existing. Refurbishment/Cut n' Carve. Matching new to existing finishes, seamlessly. Fire-retardant finishes which comply with current COSHH legislation. Chemically stripping and refinishing to bar-tops, shop-fronts, table-tops, etc. Staining, reviving, distressing, faking, graining, colouring and re-finishing. Cellulose/acid-catalyst or bar-top lacquer by hand, brush or spray. New laid hardwood flooring. Acrylic, Oil or Stain finishes. Bespoke joinery stained or polished from new. Removal of water or heat marks. We guarantee the satisfaction of all our clients both with the service we provide and our after sales customer care. Please contact us for further details or a quotation.